The Nutrisse Ultra Color series is exclusively designed to transform dark hair with ultra-reflective tones - in just one easy step! 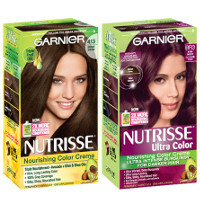 Nutrisse Ultra Color has color-boost technology that nourishes while it dramatically lifts even the darkest hair. No bleach!